Govt. 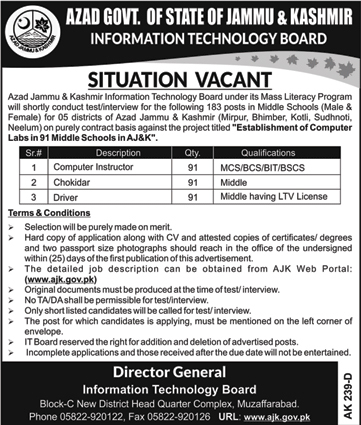 of Azad Jammu & Kashmir has announced 273 Latest Jobs in Information Technology Board. Jobs titles and number of posts are as follows, Computer Instructor (91 Posts), Chokidar (91 Posts) and Drivers (91 Posts). These vacancies are for 05 Districts (Mirpur, Bhimber, Kotli, Sudhnoti and Neelum) Interested Candidates can send their Hard Copy of application along with C.V and attested copies of all Education Certificates, Domicile CNIC Copy. Candidates should be citizen of Azad Jammu and Kashmir. Govt. of Azad Jammu & Kashmir, Information Technology Board, 273 Jobs 06 January 2018.